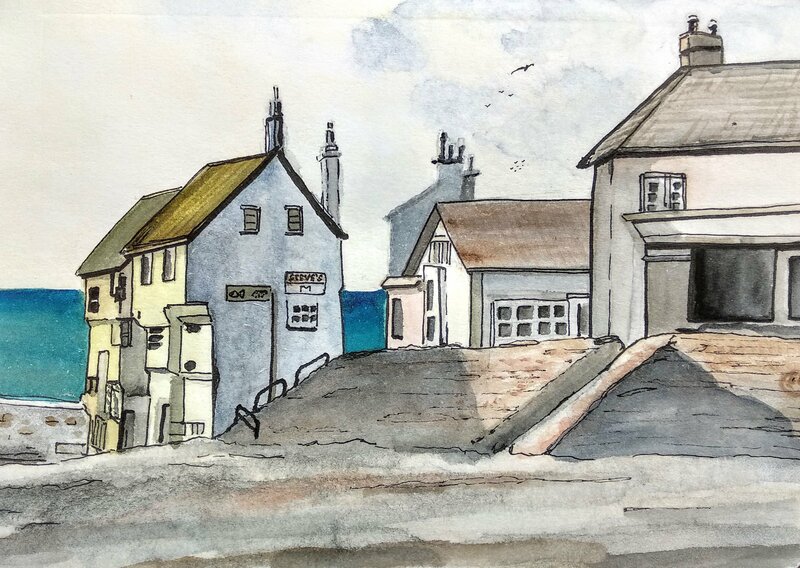 A small watercolour sketch which I then overlaid with some detail with the fineliners. I wanted to see how it would work and how it would look going over the paint with pens, trying it out in the sketchbook before I attempt it on the ongoing barn painting. Quite like the sketch actually, I might choose this for the big painting. I had considered brushing on ink but have found it can sometimes leave an unwanted shine. No such problems with the fineliners, and of course they’re a doddle to control in comparison. Beautiful light in this one Steve, really welcoming! I like this style. Will be cool to see how it translates to a larger image. So wish you had included a ‘before’ adding the pen work and an ‘after’. Thanks Alison, I’ve made it a larger image – is it cheating to just stretch it on the webpage? Yes, I should’ve done a before and after – will remember to take more “in progress” shots next time. As it was just a sketch I was just cracking on with it. Incidentally, as it’s now bigger you can see a line along the top. That’s not actually a line on the image, it’s a ridge in the paper where I shut the sketchbook whilst the page was still a bit damp and it had another piece of notepaper behind. I could probably iron it out but it’s one of those little lessons of what not to do next time. It’s gorgeous. The sunlight from the left is amazing, it really gives the late afternoon feeling… Or could it be early morning? Thank you very much, Jacob commented on the light as well – maybe I’m doing something right haha.